Welcome to the CoilyQueens™ page. The haircare regimen for tightly coily and 4C hair. Say bye bye to knots, tangles and breakage. Learn what you need to achieve longer, stronger hair becoming of the queen that you are! >trimming your hair during high energy days. As the moon grows from New Moon to Full Moon, certain days carry a stronger energy than others. You can use this energy to increase your hair growth as the moon is growing. Hopefully you left all negativity back in 2015. Being full of negative energy will only block your increase in all areas. Do not try a New Moon trim when you are in a negative disposition. The negative energy will block your success with this method. Now is the time to release all the negativity you have concerning your hair. Stop using negative terms to describe your hair. Stop stating what your hair hates or cannot do. Stop relating to your hair based on your past. Just because you never had long hair does not mean that you never will. Stop deceiving yourself, by saying you are okay with average results. Go for what you truly desire. If you want waist length hair, then say so. Shout it from your mouth! Put it out there! New Moon trimming is one of the ways you can achieve this goal. Here are the best days to trim for January. 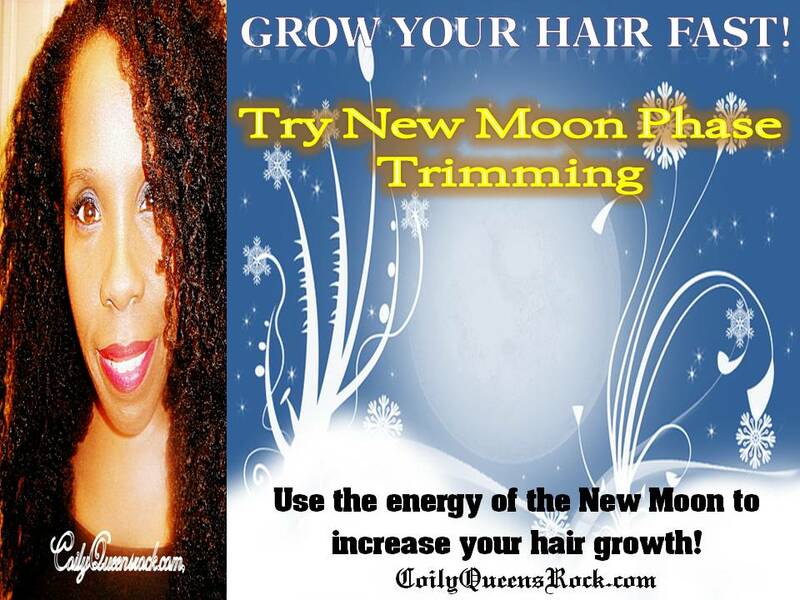 Subscribe to this blog so you can get the New Moon trim days each month. Understand you do not have to trim every month to increase your hair growth. You just maintain your normal trim schedule. >The CoilyQueens Regimen recommends trimming every 4th month to maintain healthy ends. Healthy ends help you retain more length and help your styles to look refined and fresh. Help me moisturize my hair! Help my scalp is sore! Natural hair care on a cheap budget. ©CoilyQueensRock™.com 2012-1013. Awesome Inc. theme. Theme images by molotovcoketail. Powered by Blogger.